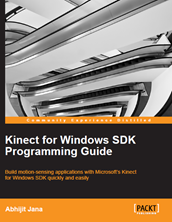 IntelliTrace debugging is only available with Visual Studio 2010 Ultimate Edition, which collects debugging information in background and can be used at any point to time to analysis previous debugging data. IntelliTrace collected debugger information into a trace log file (.iTrace ) that can then be opened and debugged using Visual Studio later. Size of .iTrace was always a concerns, as it’s take huge amount of your hard drive space and IntelliTrace is on by default. So whenever you are doing F5 debugging in Visual studio .iTrace is getting saved and it’s consuming your hard drive. Well, before moving forward, I must thank to Larry Guger , Program Manager for IntelliTrace features . Yesterday I had a discussion with him on IntelliTrace . During discussion I found there are several changes on IntelliTrace log saving which has been shifted with Visual Studio 2010 SP1. I have already blogged about few of them over here http://bit.ly/f8awhz. But few hidden stuff was missing which I got to know from Larry only. In this post I am going to discussed about those changes. Well, Check out the highlighted area, a new option has been added “Store IntelliTrace recordings in this directory” and by default it’s “Un-Checked”. If the “Store IntelliTrace recordings in this directory” option is disabled, Visual Studio creates the temporary IntelliTrace log ( .iTrace ) file in the windows Temp folder ( default : C:\Windows\Temp ) . This log file will cleaned up automatically once we stopped the debugging. So, you need not to think about unnecessary using of disk space used by IntelliTrace Log files. Now, you may have one question like. “I want the .iTrace file which is getting created on C:\Windows\Temp ? “ Simply Copy Paste ? No ! 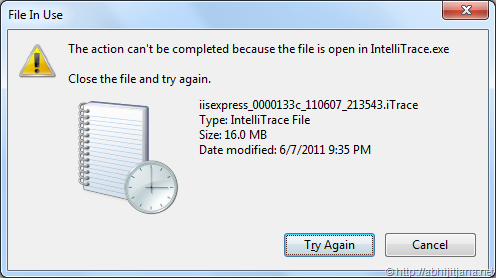 You can’t Copy a IntelliTrace File while its begging access by IntelliTrace Process. If you try to copy a .iTrace file which is being used by Visual Studio, You will get following error . So, how to get the log ? Well, Visual Studio 2010 SP1 having the features to “Save IntelliTrace log at runtime” from IntelliTrace Even window itself, as highlighted in below image. Click on the “Save” button to save the log file. Though, your IntelliTrace is not saving .iTrace automatically, you can save the log at any point of time. Yeah it’s a nice features. Finally, this is a great enhancement, If you want to save log files all the time, just checked “Store IntelliTrace recordings in this directory" in IntelliTrace settings or you can save the log at any point of time whenever you think that you need to save it. 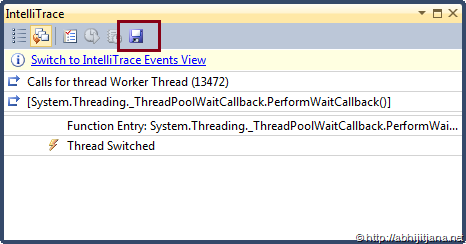 Hope this will give you some clear view on the IntelliTrace log file saving enhancement for VS 2010 SP1. I had a problem last week because of the trace logs… It was eating almost 10 GB from my HD… Good to know that with the new SP 1 I can let the intellitrace ON without further worries.